Rapper and DJ, Derek Boland, died last week (Nov 15th) of a heart attack at the age of 44. 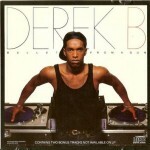 Under the name of Derek B he had two Top 20 hits in 1988, becoming one of the first UK rappers to appear on BBC TV’s Top Of The Pops. Derek was born in London, and began his DJ career at the age of 15. He was DJing around London, before going on to play for pirate radio. He then set up his own station WBLS before joining Simon Harris’s Music Of Life label in an A&R role. He ended up contributing the track Rock The Beat to the Def Beats 1 compilation (which was meant to be gathering US Hip Hop), rapping under the pseudonym EZQ. Goodgroove (released on Music Of Life) and Bad Young Brother (on the new Tuff Audio imprint via Phonogram) both reached the Top 20 in the first half of 1988. A debut album followed containing both hits called Bullet From A Gun, which charted at No.11 in the albums chart. His only other major chart success was in quite a different vein, as co-writer of the Anfield Rap, reaching No.3 in the singles chart for the Liverpool FC football team. He also worked with Eric B. & Rakim and the Cookie Crew. Derek B, you’ll be missed. Sadly, little of his recorded output seems to be available at present, but I did manage to find one track currently available, and that’s Derek B’s Urban Respray remix of Eric B. & Rakim’s Paid In Full. This is included on the classic Eric B. & Rakim album Paid In Full – Deluxe Edition. You can also hear that track in full if you head on over to Sunshine Playroom’s Jukebox area. This entry was posted on Saturday, November 21st, 2009 at 4:58 am	and is filed under Music, News. You can follow any responses to this entry through the RSS 2.0 feed. You can leave a response, or trackback from your own site. Pretty site, regal wallpaper. Nice. What a sad bit of first news! On the jolly side, it is farmer and Blur bassist Alex James’ birthday today, too. Happy Birthday Alex James, hope you’re enjoying some cheese on your farm.